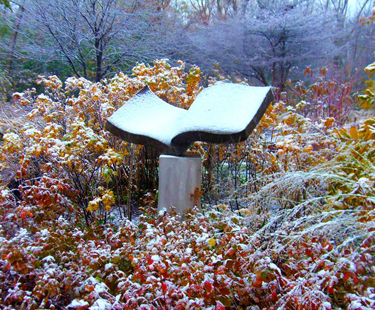 A beautiful garden in winter at the Bensenville Community Public Library (Bensenville, IL) features "Book for the Father, Vol. I". The "Mountain Fishing" bronze sculpture, long thought to be extinct (Sold Out), has reappeared back on the market and is currently available for purchase. 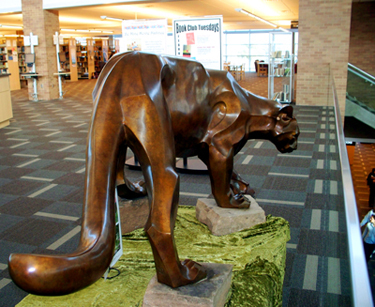 It is shown here at the Lewisville (TX) Public Library, where it was previously on display, prowling the stacks and watching over patrons from the second floor. "Mountain Fishing" is currently on display at the Pine River Library District in Bayfield, CO. Check back often as we continue to display new works by our artists at our participating libraries. Above: "Book for the Father, Vol. I" by Sculptor Kevin Robb. Photograph by Samantha Parkison of the Bensenville Community Library. Below: "Mountain Fishing" by Sculptor Rosetta. 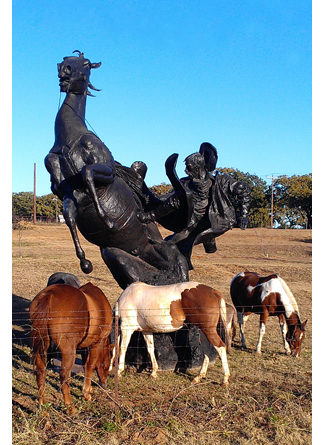 "Slicker Shy" by Sculptor Herb Mignery is shown in its natural habitat on the Red Horse Ranch in Texas. Now available for purchase, please contact us for details on this one of a kind monument. Above: "Slicker Shy" by Sculptor Herb Mignery. Photograph by Larry Howard. Sculptureworks represents a Juried International Consortium of Sculptors. All works on our web page are for sale unless noted otherwise. Contact us for current prices on sculptures you may be considering for purchase. Sculptureworks provides consulting for commissions as well as a wide inventory of sculpture for public or private purchase. Each sculptor welcomes commissions and Sculptureworks is open to conversations to meet your needs. Many times a small maquette or study piece can be enlarged lifesize or larger for a specific placement. Planning for commissioned sculpture often includes exhibits, lectures, and workshops. Sculptureworks works in cooperation with the art sculpture community to make sculpture available to the public through library displays, other public displays, sculpture shows and sales, and events in local businesses such as Barnes & Noble Booksellers. Sculptureworks wishes to thank the great resource of volunteers from our participating libraries, along with their Friends and Patrons groups. 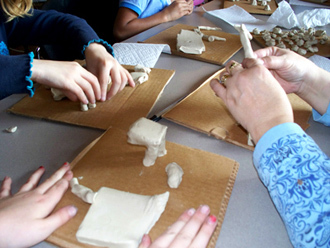 Sculptureworks brings the World of Art to Life @ Your Library! Special thanks to Sculptor Paul Oestreicher, who recently provided a presentation at the Carmel Clay Public Library in Indiana. The library is currently enjoying an exhibit of more than 100 sculptures. Read more news about the Carmel Clay event in our News section. 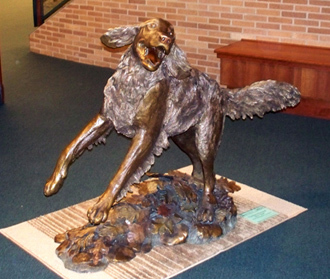 Above: "Bob" the dog, by Sculptor Paul Oestreicher, is shown at the Carmel Clay Public Library. Special thanks to Sculptors Tuck Langland and Karryl, the Artists in Residence for a week of sculpture classes at the Bensenville Community Public Library in Illinois (November 17-21, 2009). The library unveiled their new bronze sculpture "Kipling's Jungle Book" by Tuck Langland at their 50th Anniversary Celebration in May. Read more news about the Bensenville event in our News section. Above: Busy hands at work at the Bensenville Community Public Library. 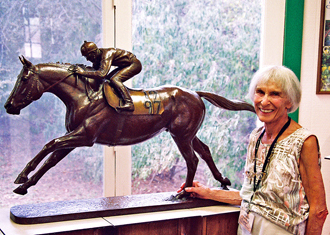 Marilyn Newmark displayed her fabulous equine sculptures at Weston Gardens (October, 2007) in the old horse barn. Above: Marilyn Newmark with her sculpture "Leading the Field" at Weston Gardens. 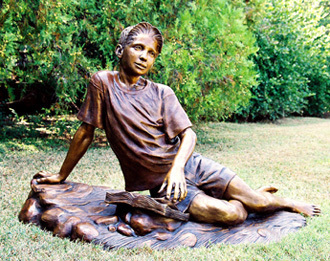 Paul Oestreicher featured his sculpture at Weston Gardens (August, 2007), highlighting the lifesize "Matthew's Journey" (shown below). Above: "Matthew's Journey" by Paul Oestreicher. John Sewell displayed his fabulous sculpture at Weston Gardens (July, 2007). Despite the Texas heat, the weekend was a wonderful showcase of John's talents. 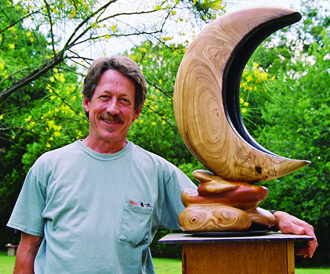 Above: Sculptor John Sewell stands with his carved wood sculpture "Waxing/Waning". 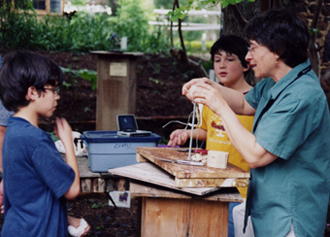 We would also like to send out a special thanks to Karryl for her sculpture weekend at Weston Gardens (May 5-6, 2007). Despite the unpredictable weather, Karryl (and her unique sculptures) managed to bring great joy to everyone who came out to the gardens! Above: Andrew (left) & Johnny (right) enjoy Karryl's monument "Got Gnus?" at Weston Gardens. Below: The boys learn about the sculpting process from Karryl. 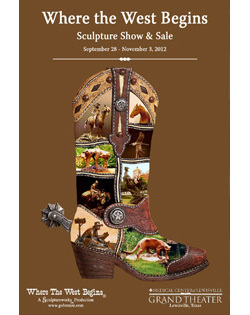 Our Fall 2012 "Where the West Begins" Sculpture Show & Sale featured numerous works from our Sculptureworks consortium. See our news section about the installation of "Slicker Shy" and the dedication of "Slicker Shy" by Herb Mignery at the Lewisville City Hall, the unveiling of "The Alphabet Chair" by Sarah Peters at the Lewisville Public Library, and the unveiling of "Kipling's Jungle Book" by Tuck Langland at the Bensenville Community Public Library. 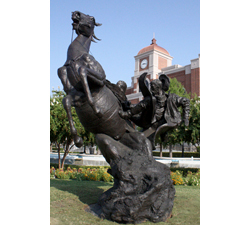 Above: "Slicker Shy" by Sculptor Herb Mignery. Photograph by Elizabeth Loggins. 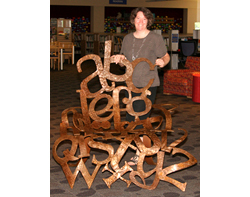 Above: Sculptor Sarah Peters with "The Alphabet Chair". Photograph by Tim Phillips. 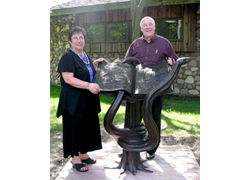 Above: Bensenville Library Director Jill Rodriguez and Sculptor Tuck Langland with "Kipling's Jungle Book". Photograph by Julianne Bacon. 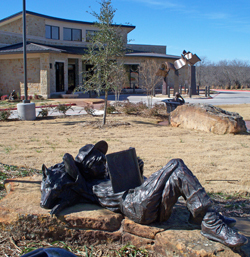 Five works by Sculptureworks artists were recently installed at the new Azle, Texas, Memorial Library. "The Need to Know" by Hollis Williford first greets visitors who choose to stroll down the landscaped walkway towards the library. Visitors can then sit and relax on a park bench next to "Quiet Time in the Park" by Susie Chisholm. 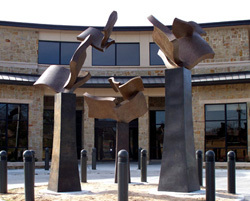 Next, the monumental "Soaring to New Heights Through Reading" sculpture by Kevin Robb, composed of three pedestals holding six flying books, graces the front entrance of the new library. Also near the front of the library stands "Readin' Time" by Bill Bond. Finally, inside of the library visitors will find the friendly "Library Cat" by Rosetta, which was commissioned out of love for Azle's beloved "Library Cat" Molli who, at 15 years of age, passed away while the new building was under construction. 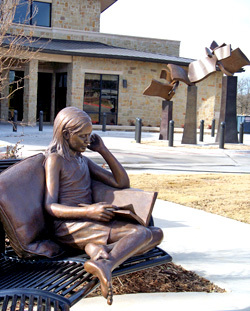 Above: "The Need to Know" by Sculptor Hollis Williford is the first sculpture to greet visitors to the new Azle, TX, Memorial Library. Above: Visitors can relax next to "Quiet Time in the Park" by Sculptor Susie Chisholm. Above: "Soaring the New Heights Through Reading" by Sculptor Kevin Robb graces the front entrance of the new library. 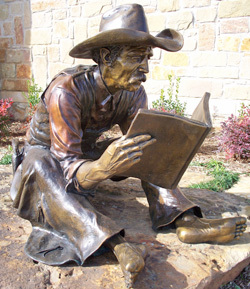 Above: "Readin' Time" by Sculptor Bill Bond sits near the front of the new library. 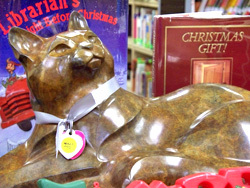 Above: The lovable "Library Cat" by Rosetta greets visitors inside of the library. 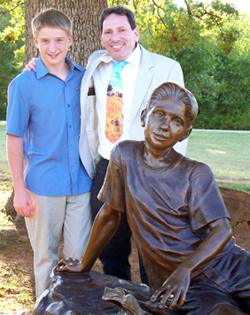 The lifesize sculpture "Matthew's Journey" by Paul Oestreicher was dedicated at The Old Bedford School on Saturday, October 25, 2008. In early 2011, the sculpture will be relocated to its permanent home at the new Bedford Public Library. 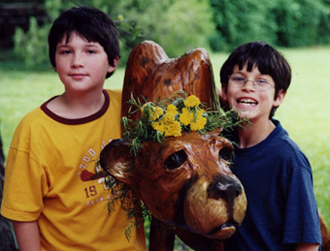 Above: Matthew (left) and Paul (right) stand next to the lifesize sculpture "Matthew's Journey" by Sculptor Paul Oestreicher. Copyright © 2001 - 2016. Sculptureworks, Inc. All rights reserved.